Turkey, on the south east edge of Europe (in-fact Turkey is partly in Europe and partly in Asia) was bound to be different. Turkey has the benefit of a long coastline, both on the Mediterranean and the Black Sea, while inland has high ground, with the mountains in the east rising to over 5,000m, resulting in several locations where winter sports are possible. You will find hospitality, superb Mediterranean beaches, history and spectacular mosques in this rapidly modernising country. The currency in Turkey is the Turkish Lira (TRY). (1 Lira = approximately 0.25 British Pounds or 0.30 Euros). 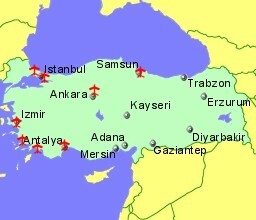 Located 30 Km south east of Istanbul (the Asian side), Turkey, built to take the pressure off Istanbul Ataturk.